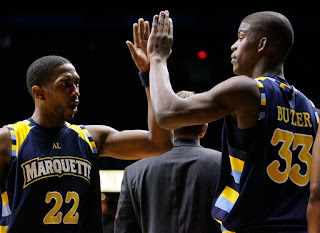 Is Marquette "Trap-Game Proof"? ~ The Bucky Channel - The World of Sports from Wisconsin's Perspective. Home » DePaul Blue Demons , Dominic James , Jerel McNeal , Jimmy Butler , Marquette Golden Eagles , Sports Bubbler , Wesley Matthews » Is Marquette "Trap-Game Proof"? Game after game, you wait for them to fall. You wait for the Marquette Golden Eagles to get a little too confident and cocky, and then blow it against a less superior team. But it hasn't happened. And unless this column proves to be the jinx, I'm not sure it will happen. Marquette may be what I like to call "trap-game proof". They don't seem to look past anybody, no matter how bad their opponent may be. One might think that their upcoming game at South Florida has potential letdown written all over it, but I expect it to be another easy victory. Easy victory was the name of the game on Tuesday night, as Marquette traveled down to Rosemont to knock off DePaul 76-61. The usual suspects topped the box score again, as Jerel McNeal lead with 26, Wesley Matthews had 20, and Dominic James had 15. It's the 12th straight victory for MU, who now improves to 9-0 in the Big East. Walsh made the trip down last night, and he has some random observations. Hopefully they can keep this streak going and keep getting the wins when they are easy to come by, as things are going to only get harder from here. Their last four conference games are against teams in the Top 25, three of whom are in the Top Ten. They'll also be tested next week Tuesday as they travel to Villanova, currently ranked No. 16. Uh, have you seen the end of their schedule? All the other premier Big East teams have been beating up on each other while Marquette has been knocking off the mid-levels & doormats. I'm impresed with what Marquette has done so far, but my point is that the final two weeks of the season are going to be grueling & telling. I guess it helps to play a lot of the big boys near the end of the season because it takes some of the guesswork out of preparing for the conference tourney. Bill Simmons is on Board! Hey, Wisconsin Got Two Votes! Peppers to Packers a Reality? Hey, UW-Green Bay Got a Vote! Is Sheeter "Pulling a Favre"? Did They Also Call Florida for Gore?